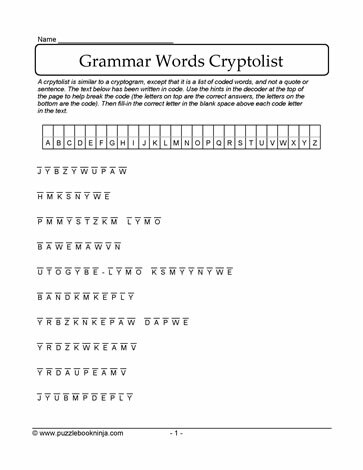 Cryptolist of grammar words printable puzzle to engage students' problem solving skills with puzzles. Suitable for middle grades 7,8,9 classrooms and students who are home schooled. Students decode the letters in each of 10 words to solve this cryptolist puzzle. Record letter substitutions in the table. Challenge family, friends and classmates to see who can be the first to complete these free puzzles. Enrich late elementary students' curriculum with these puzzles. Puzzles such as cryptolists and cryptograms help to keep the brain active.